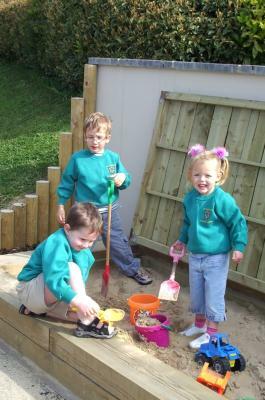 Children at a Wotton-under-Edge pre-school have been making the most of the recent warmer weather in their new sandpit. Since September the thriving Kindergarten at the British School has raised more than £2,000 towards its new play equipment. Outdoors is the new large sandpit and indoors the home corner has had a "make-over" with modern play kitchen and accessories. The Chair of the Kindergarten Committee Jenny Burden said: "The children love the sandpit - we have worked really hard over the last year to extend the range of toys and equipment that are available for the children. We particularly want to thank Wotton's business community which has generously supported the fund raising events." Money for the new equipment was also donated by the British School and its Oscars out of school club. The Sandpit will be used by both the Kindergarten's pre-school groups and the infants at the British School, including reception and year 1. Jenny Burden added: "We have had a really good take-up of pre-school places for September with only a few slots still available. We would encourage parents to contact us as soon as possible to book places to make sure their children don't miss out on the opportunity and fun of attending Kindergarten." The pre-school groups at the British School are Pooh Corner (0-2 yrs), Tyggers (2-3yrs) and Kindergarten (from 2 years 9 months). For further information please contact the British School on 01453 843371.